When life hands you lemons...have fun! Your little shopper will delight in the Lemons Bulk Fruits and Veggies Bundle from Melissa and Doug. Molded from a real lemon, these gloriously yellow pieces of fruit will provide great visual appeal to your market or lemonade stand display. 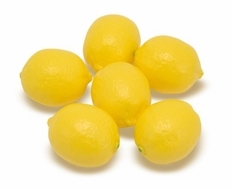 Made of durable plastic, this pack of six lemons will add "zest" to many pretend recipes and will never squirt you in the eye!